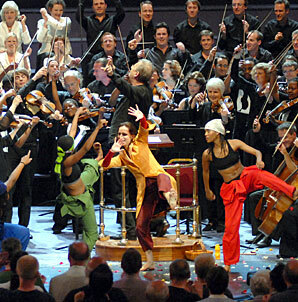 His point of departure was a statement by the current British culture minister, Margaret Hodge, who has recently attacked — of all things — the Proms, that popular and populist-appearing phenomenon that occurs in London every summer where, for a modest ticket price, “punters” can mill about on the ground floor of the vast Royal Albert Hall (the seats having been removed) during presentation of some of the best music by some of the best performers this world affords. These hugely varied weeks of music constitute the largest and most popular music festival in history. But Ms. Hodge’s complaints say nothing about the music offered or about the size and enthusiasm of the audiences. She speaks only of the apparent fact that the class of the people showing up is — oh, the shame of it! — middle. C.S. Lewis once said that he had spent his whole life being despised for being middle-class: in his Edwardian youth for being too low and later on for being too high. The relative scarcity of upper- and lower-class folk at such events is clearly an issue worth thinking about. But is it a musical issue? Do the presenters of the Proms, who give every evidence of meaning to speak in diverse and highly communicative tones to the public, fail in their programming because one class — and that of the most middling category — shows up in greatest numbers? Or can it be that other forces in society determine these things? Even more basically, is the Proms’ duty mainly to the music or to the human beings who come (or don’t come) to experience it? A most apt answer is found in what might seem an out-of-the-way place. Dorothy L. Sayers (yes, she of the Lord Peter Wimsey mysteries) spent much of World War II writing essays and delivering addresses of a surprising depth of thought and lasting value. One of these speeches, given at Eastbourne in 1942 and subsequently published, is called “Why Work?” In it she takes positions that are anti-capitalist, anti-collectivist, anti-pietist, anti many other things. But what they are for is work itself. Good work. She claims that, if you focus on service to the people, service to a cause, service to a deity, even, you will at some point fail. But if you concentrate on serving the quality of the work, you will serve all your possibly higher aims better than if you compromise your work to suit the purportedly more exalted goals. Alas, Amazon.com tells me that the text is no longer in print. (I have it in a collection called Creed or Chaos?, which is replete with unexpected insights on everything from feminism to playwrighting.) But, if you care about the role of music (or any other kind of virtuous labor) in society — or care about any of the causes into which it is often impressed to serve — check your public or university library for a copy. It may clarify your thinking enormously. And their excellence is such that their conductor, Gustavo Dudamel, has now been appointed successor to none other than Esa-Pekka Salonen at the Los Angeles Philharmonic.